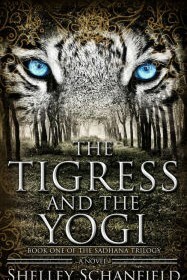 The influence of myth is inescapable in The Tigress and the Yogi, the epic first installment in Shelley Schanfield’s Sadhana Trilogy. The action unfolds in a setting very similar to ancient India of 2,500 years ago. Although it’s clear that the story is a work of fantasy, the book is steeped in the ancient myths, folklore and energy of that country. The author’s main characters operate in the world of Brahmins and castes; the protagonist’s journey is tied closely to the mythical voyage of Siddhartha, the prince who abandons his privilege to become the Buddha. This structure makes for fascinating reading for anyone remotely interested in Eastern religion and culture. From chapter one where Schanfield introduces Mala, a young girl of a low caste whose father is a poor tanner, the author also introduces gods and philosophies from ancient Hinduism. Mala discovers an uncanny link with the natural world, specifically the ability to communicate with a tiger she happens upon in her village of Gauri. That skill comes into play after the murder of her parents and her escape from servitude, as Mala embarks on a spiritual voyage that takes her far from her roots. She meets thieves, kings and gods and visits sacred cremation grounds, holy cities and the realm of Siddhartha, who will eventually reform concepts of caste, karma and inner peace. Throughout, Mala seeks an elusive sense of contentment and purpose. The author’s scholarship in crafting this ambitious tale is impressive. The story of Mala’s long journey toward serenity includes a wealth of context and details regarding Hinduism, Buddhism and Eastern history. With a strong and graceful writing style, Schanfield combines spirituality and action in a way that’s consistently compelling. Even so, the length and density of the spiritual message may put off casual readers. This impressive debut is more appropriate for those with an interest in Eastern philosophies. Those readers will find plenty to meditate on in this carefully plotted adventure.